Eclipse provides a bookmarks feature out of the box which allows bookmarks to be placed in source code and text files and stored together with the project. However, usage of these bookmarks is tedious as creating a new bookmark requires the user to enter a label and direct navigation between bookmarks via keyboard shortcuts is not possible. Quick Bookmarks extends the standard bookmarks by providing actions and shortcuts to quickly toggle a bookmark in the current editor line and to jump to the previous and next bookmark from the current cursor position. Quick bookmarks are a subtype of the standard bookmarks. Their display options can therefore be configured separately, yet they are still included in Eclipse's own bookmarks view. A quickmark is a special type of quickmark that can be used to mark a single location for a short time. Only one quickmark can be active at any given time. When jumping back to the quickmark, it will be deleted automatically. Press Ctrl+Alt+B (Command+Alt+B on Mac OS) to set or delete a bookmark in the current text editor line. Press Alt+PgUp and Alt+PgDn to jump to the previous or next bookmark in the current editor. Press Alt+End to bring up a dialogue listing recent bookmarks. To navigate between bookmarks across files, use Shift+Alt+PgUp and Shift+Alt+PgDn. When jumping to the next bookmark after the last one in the current file, or to the previous bookmark before the first one, this will jump to the next or previous file in the workspace. To set the quickmark, press Alt+Home. Pressing the same shortcut again will jump back to the previously set quickmark, deleting it. To reset the quickmark to the current location if it already exists, or to delete it if if is at the current location, use Alt+Shift+Home. A quickmark can be useful to mark a single location and jump back to it after searching for a specific piece of code. The quickmark is also included in regular bookmark navigations. Jumping to it in that way will not delete it. Alt+Home can be used to set a quickmark which will automatically be deleted when Alt+Home is pressed again to jump back to it. Additional commands can be used to navigate between bookmarks across file borders, either within the current project or the entire workspace. Workspace navigation is assigned to Shift+Alt+PgUp and Shift+Alt+PgDn by default (project navigation has no default keyboard shortcut assigned). By default, bookmarks in the Jump to Bookmark popup dialogue are ordered chronologically by their last use. A new context menu on the bookmarks list can be used to change the sorting order to order bookmarks by their project, file and position. Holding down the shift key when selecting a bookmark in the popup dialogue (or using the dialogue's context menu) will jump to the file containing the bookmark without repositioning the cursor in the editor. The Jump to Bookmark dialogue now has a third page which lists all workspace bookmarks. Bookmarks store the type of the editor they were set in. Even if the default editor for a file type changes, bookmarks for that file will still open with the same editor they were created in. Pressing Alt+End brings up a dialogue listing recent bookmarks. 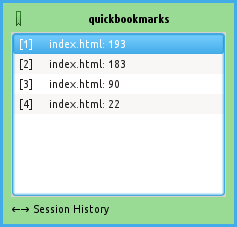 Quick Bookmarks requires Java 6 and Eclipse 4.2 (Juno) or higher. You can now open the site in the list of available software, check Quick Bookmarks and click Install to begin the installation process. Sets a new quick bookmark in the current editor line, or removes a bookmark if there already is one for this line. Deleting a bookmark also works if the bookmark is a standard Eclipse bookmark, but newly created bookmarks will always be quick bookmarks. The default shortcut is CTRL+Alt+B (or Command+Alt+B on MacOS). Jumps to the next bookmark in the current file, relative to the current cursor position. This includes both quick bookmarks and standard Eclipse bookmarks. If there are no bookmarks after the current position, the cursor is not moved. The default shortcut is Alt+Page Down. Jumps to the previous bookmark in the current file, relative to the current cursor position. This includes both quick bookmarks and standard Eclipse bookmarks. If there are no bookmarks before the current position, the cursor is not moved. The default shortcut is Alt+Page Up. Jumps to the next bookmark in the current project. Like Next Bookmark, but when moving past the last bookmark in the current file, the cursor is moved to the first bookmark in the next file of the current project. After the last file in the project, navigation wraps around to the first file. No default shortcut is assigned to this command. Jumps to the previous bookmark in the current project. Like Previous Bookmark, but when moving past the first bookmark in the current file, the cursor is moved to the last bookmark in the previous file of the current project. After the first file in the project, navigation wraps around to the last file. Jumps to the next bookmark in the current project. Like Next Bookmark, but when moving past the last bookmark in the current file, the cursor is moved to the first bookmark in the next file of the workspace. After the last file in the workspace, navigation wraps around to the first file. The default shortcut is Alt+Shift+Page Down. Jumps to the previous bookmark in the current project. Like Previous Bookmark, but when moving past the first bookmark in the current file, the cursor is moved to the last bookmark in the previous file of the workspace. After the first file in the workspace, navigation wraps around to the last file. Opens a dialogue listing recent bookmarks. See Jumping to Bookmarks. The default shortcut is Alt+End. Jumps to the current quickmark, deleting it. If no quickmark exists, sets it to the current locaiton. The default shortcut is Alt+Home. Sets the quickmark at the current location or clears it if it is already set there. The default shortcut is Alt+Shift+Home. The default keyboard shortcuts can be reconfigured using the General/Editors/Keys page in Eclipse's preferences. By default, the dialogue lists the most recently used bookmarks in chronological order. Whenever you add a new bookmark or use this dialogue to jump to a bookmark, it is moved to the top of the list. The sorting order can be changed by opening the context menu of the list (e.g. via right clicking), where you can switch between the default chronological order and sorting the bookmarks by their project, file and position in the file. The dialogue lists either all bookmarks from the current project, all bookmarks from the current workspace, or the most recent bookmarks from your current Eclipse session. The title bar shows which set of bookmarks is current displayed, and the Left and Right cursor keys can be used to switch to the other set. The Up and Down cursor keys can be used to select a bookmark. Pressing Return jumps to the selected bookmark. The selected bookmark can also be deleted using the Del key. A bookmark can be selected by pressing the return key or by double clicking. If the shift key is pressed when selecting a bookmark, the editor will jump to the file containing the bookmark without repositioning the cursor (i.e. without jumping to the bookmark itself, instead retaining the previous cursor position in case the file had already been opened). Both actions are also available from the context menu. Quick bookmarks are shown in the vertical ruler (to the left of the editor's text area) and the overview ruler (to the right) by default. The icon shown in the vertical ruler is similar to that of the standard bookmarks, but in green: . In the overview ruler, the colour used to draw the marker is the same as that for standard bookmarks. Quickmark use a similar icon in yellow, with yellow markers in the overview ruler: . The Quick Bookmarks entry in Eclipse's preference dialogue allows you to change the colours of the bookmarks popup. The default display settings for quick bookmarks and quickmarks can be changed in Eclipse's annotation preferences, which can be found under General/Editors/Text Editors/Annotations in the preference dialogue. Quick Bookmarks was written by Marian Schedenig. You can find my website here. Quick Bookmarks is licensed under the terms of the Eclipse Public License v1.0. Copyright © 2014 Marian Schedenig.